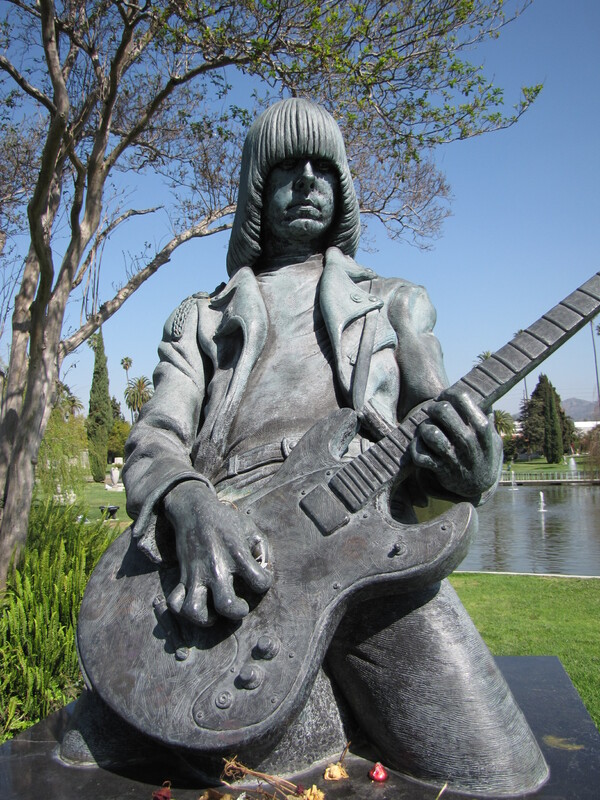 The sculpture of Johnny Ramones on top of his memorial in the Hollywood Memorial Park. Joey Ramone/Jeffrey Ross Hyman (May 19, 1951 – April 15, 2001) was the lead vocalist of the punk rock band. Joey died of lymphatic cancer and was buried at Hillside Cemetery in Lyndhurst, New Jersey. Dee Dee Ramone /Douglas Glenn Colvin (September 18, 1951 – June 5, 2002), was a songwriter and bassist for the Ramones. 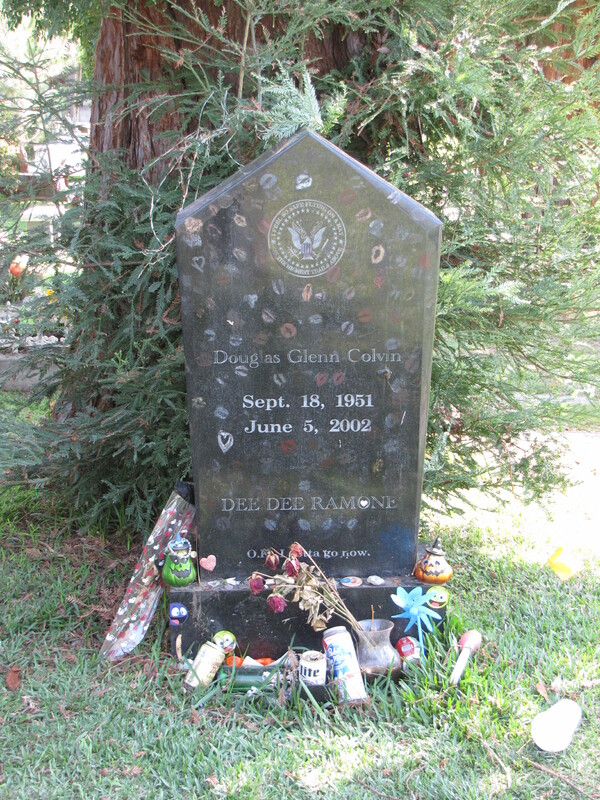 Dee Dee Ramone died of a drug overdose and was buried in Hollywood Memorial Park Cemetery. Johnny Ramone/John William Cummings (October 8, 1948 – September 15, 2004), was a guitarist and songwriter for the Ramones. Johnny died of prostate cancer and was Hollywood Memorial Park Cemetery. Tommy Ramone /Thomas Erdelyi (born Erdélyi Tamás (January 29, 1949 – July 11, 2014) was the drummer for the Ramones. Tommy Ramone, 65, the last surviving member of the Ramones, died Friday, July 11, 2014. Arrangements for his funeral and the circumstances of his death have not been announced. The Ramones’ first album debuted in 1976, and though they never had a top 40 hit, the band toured for 20 years to enthusiastic fans. Though the band was never considered a commercial success, many rockers noted the influence of their music on bands, such as, Green Day and Nirvana, and musicians, such as, Bruce Springsteen. Dee Dee Ramone’s gravestone in the Hollywood Memorial Park Cemetery.